"We should be always engaged in active service. Then, some way or other, our mind will be engaged in Kṛṣṇa's lotus feet. That is required, activities. Sa vai manaḥ kṛṣṇa... Just like Mahārāja Ambarīṣa. He was statesman, emperor; still, he was fixing up his mind in Kṛṣṇa's lotus feet. That practice we should... Abhyāsa-yoga-yuktena (BG 8.8). If we do something... Suppose you are going to distribute books. But what is the idea? 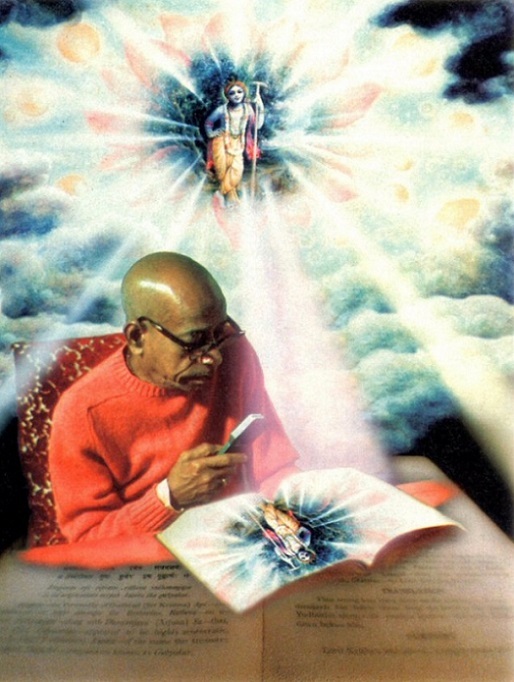 'It is Kṛṣṇa's books; it must be distributed.' So Kṛṣṇa is remembered there. At the same time, because it is Kṛṣṇa's book, if somebody purchases, if he pays something, he'll look at it, something, that 'What this nonsense has written? Let me see.' Then he will get some idea. And if he reads one line, he comes hundred times forward to Kṛṣṇa consciousness. This is the idea. If you want... Svalpam apy asya dharmasya trāyate mahato (BG 2.40). This is preaching. Similarly, Kṛṣṇa is everywhere. Aṇḍāntara-sthaṁ paramāṇu-cayāntara-stham (BS 5.35). Any wood you take, there is fire undoubtedly. Everywhere is Kṛṣṇa, but sevonmukhe hi svayam eva sphuraty adaḥ. If you engage yourself in service, then you'll see the fire, Kṛṣṇa, there, in everywhere. Sarvatra sphurāya tāra iṣṭa-deva-mūrti (CC Madhya 8.274). That stage wanted, that whatever he'll see, he'll see Kṛṣṇa. 'Here is microphone. Here is loudspeaker. Where is Kṛṣṇa?' Yes, here is Kṛṣṇa, because we are speaking about Kṛṣṇa through this microphone. He is there. So we have to practice this bhakti-yoga according to the direction of the authorities. Then you'll realize Kṛṣṇa. Then the cause and effect, sarva-kāraṇa-kāraṇam... (Bs 5.1). Everything will be realized, and every moment you will see Kṛṣṇa. Premāñjana-cchurita-bhakti-vilocanena santaḥ sadaiva hṛdayeṣu vilokayanti (Bs 5.38). So unless we get that stage, we should not imitate personalities like Haridāsa Ṭhākura and others. We should wait for. That is the ultimate stage. But we should practice and work actively for understanding Kṛṣṇa. That is Kṛṣṇa consciousness movement."